Over course of the past year I spent some time on the Women and Infant’s Hospital Family and Patient Advocacy Council (it’s a mouthful…thank goodness we didn’t get business cards). In that time I had the great pleasure of meeting a few other patients as well as connecting with staff and administrators of the hospital. There was one ovarian cancer patient that stood out to me, Rhonda. This woman is kind, honest, and upfront with her ideas and experiences. There was one day several months ago when I was at the point in my clinical trial treatment where I just had enough. I hadn’t vocalized it to my medical team yet and it was causing me a great deal of anxiety. After the PFAC meeting I happened to pass Rhonda in the hallway on the way to the bathroom. Now keep in mind that outside of this group, I really didn’t know her at all. She asked how I was doing and often times those words are just enough to drive an overly emotional person like myself into a tear fueled tizzy. I divulged to her the inner conflict that I was having about my treatment options and the fear that I was making the wrong choice in light of how high the stakes are. She listened intently, not breaking eye contact. You can really see it in someone’s eyes when they understand your fear and struggle. She knew well. Despite having high stakes challenges of her own, Rhonda was reassuring and purely optimistic without being dismissive. I felt so understood by someone that didn’t have to understand me. I felt so cared for by someone that didn’t have to care- but she did. That interaction stayed with me. As time went on and transitioned into new treatment I felt that it was best to take some time away from the council. That being said I haven’t seen Rhonda but through a very sweet oncology nurse, more recently we were able to keep up with one another. I received news that Rhonda left the physical world yesterday morning. I am heartbroken but glad to know that she was at home, surrounded by her loved ones. Despite our limited interactions, this woman had such a profound impact on me. When I learned of her passing it felt like a punch in the gut. Part sadness for the suffering she and her family endured, especially in her final weeks. Part fear over the grim reality of this disease and how quickly things can change. I am fully aware that we have different bodies, different circumstances, but regardless it hit close to home. My sincerest condolences go out to anyone that had the pleasure of knowing, treating, or loving this woman. I know she was a fan favorite at WIH. The last two days since finding out about Rhonda has left me feeling a bit out of sorts. After work today I was sitting in my apartment trying to distract myself with Netflix but I was just too antsy. After running an errand I ended up at my Mecca, the book store. 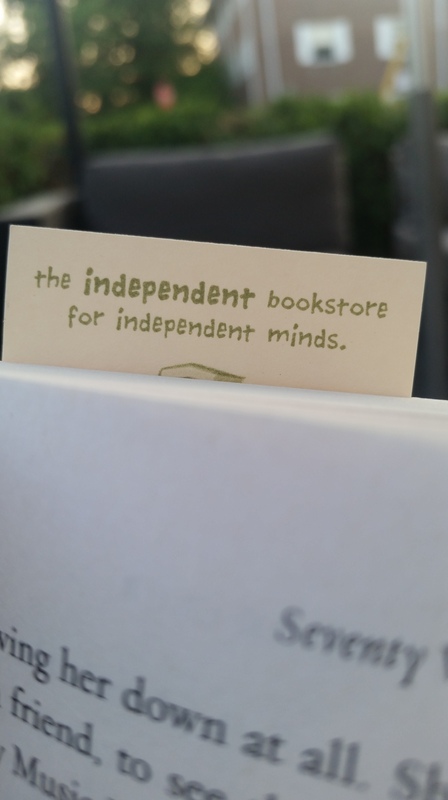 I am the child of two voracious readers so it is only appropriate that in times of inner turmoil, I turn to the bookstore for distraction and clarity.There is a little book shop in Wayland Square called Books on the Square that I absolutely love. I like to open to a random page and read a paragraph out of context to get a feel for a book when I’m browsing. I crack the book open (honestly thinking that I’ll just read a few lines, say ehhh, and return it to its standard, upright position). Before I can read a single word- DRIP. DROP. Captain we have a nosebleed. It also seeped into the page before and after it. Whoops. I did have that momentary: “I could probably just put this back…” thought but in good conscience I couldn’t possibly re-shelve a book that I just BLED into. The bookstore clerk was kind enough to provide me with some tissues as I continued to gush blood into my hand. I politely tried not to leave my DNA all over the store and quickly excused myself to the bathroom to clean myself up. 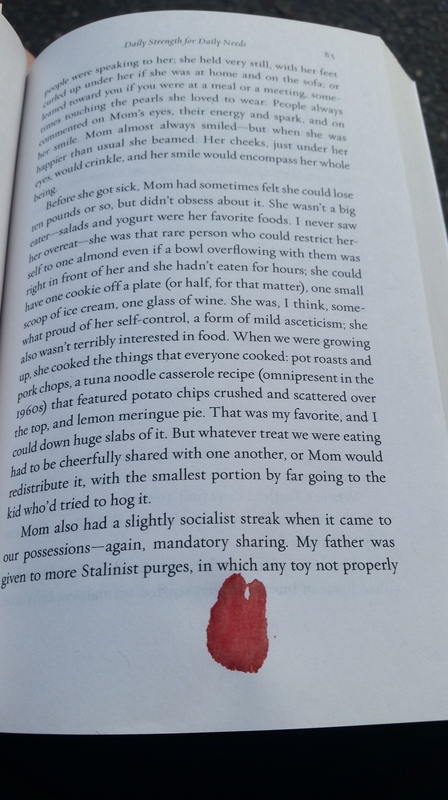 When the pipelines dried up, I returned to the counter and sheepishly shrugged: “ummm so I guess I’m buying this now?” The clerk must have felt bad for me because she gave me a 30% discount ( I mean after all, there was blood in my book. No need to point fingers as to how it got there…). Well my friends, there are no accidents. I think I was destined to read this book that I was going to carelessly return to the shelf (pre-Bloodkstock ’15). 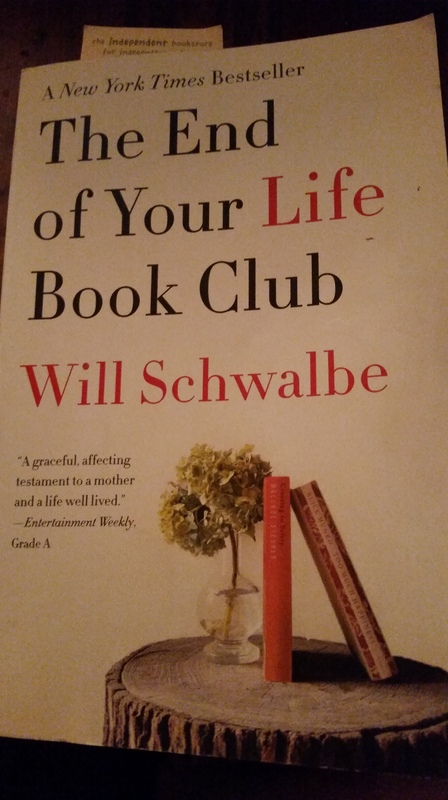 It turns out that The End of Your Life Book Club recounts a man’s experience of his mother’s pancreatic cancer treatment and the bond that they shared over trading and discussing literature. From what I have read so far, it brings to light how powerful the written word can be as a common thread between individuals facing great upheaval. I am only 45 pages in but perhaps there is something to be learned from this book. If there is, I will be sure to report back! One of the book’s themes deals with issues of mortality. If anything it will force me to really process Rhonda’s passing and not internalize it from a place of fear but more from a place of acceptance and understanding. You are an absolutely incredible writer, Jess, and have the capacity to make me both laugh and cry. You are able to make me feel exactly what you’re feeling. Hope you know how truly special you are. OMG!!! So funny!! Love that book store too!! Sometimes it’s just meant to be! Keep shining my bear cub! Thinking of everyone who knew and loved Rhonda. Wish I had met her. RIP. When I read your blogs I just think over and over ‘I’m so lucky to know this woman – love you Jess, just love you’. That book was meant to be yours!! !